“I have given a lot of thought to this since the 2009 Visa Championships,” said Liukin, who competed in the Visa Championships in Dallas earlier this month. “Getting back into the gym and competition has been a major goal for me this summer, and I have worked hard to balance my training and obligations. This past year has been wonderful and a whirlwind. With the selection process for Worlds beginning next week, I realized I need to take some time to get myself where I need and want to be competitively. Competing at a World Championships is an incredible experience, and I look forward to supporting my teammates as they prepare for London. I totally respect her decision. Good for her for being mature enough to not just say "why not, even if I'm not ready". So I'm standing by my prediction... Bridget, Sam, Ivana, Kayla. Thoughts now? So uh... Bridget Sloan won nationals! Yay! Yes, I realize that it's old news by now... Sorry about that. I just finished celebrating my 16th birthday and going back to school, so I kinda have an excuse. Lol. In any case, guess what's in about 2 months??? So on USAG's site, they posted about the selection process. Basically, there's two camps - one Sept. 8-12, the second Sept. 30-Oct 4. 16 girls were invited to the first camp already, essentially the senior national team. After that, no less than 8 girls will be invited to the second camp. So essentially, all 16 girls could go through to camp numero dos, but that probably won't happen. Now I know some of you are like, "WTF Kayleigh, WTF?" But let me explain! 1. Bridget should obviously be on the team, as national champ and the gymnast with the highest all-around score this year at any meet. 2. I can't imagine Samantha not being put on the team. She was solid as a rock at nationals - her confidence is ridiculous, and I really think she could medal on beam. 3. Kayla... I'm iffy between putting her or Nastia on the team. Kayla could potentially medal on vault and floor both... but how would she do with the international judges? 4. This one came down to Ivana and Rebecca... and when it comes right down to it, I think Ivana is the better gymnast. I don't understand the obsession with Rebecca - she's got big skills, yes, but they aren't clean, IMO. I think Ivana would definitely go over better with the international judges. And could Rebecca handle the pressure of worlds already? I'd have doubts. -Rebecca looks good! Her bars were awesome! -LOVE Bridget and Samantha's leos. And their vaults were great! -Kytra Hunter's floor = <333. Her tumbling is phenomenal! -Not Ivana's best on bars. She saved that dismount! -Thought Kytra deserved more than 14.4. -Nice stuck dismount from Jana. -Not crazy about Rebecca Clark's floor. Not enough choreography. -Not crazy about the GAGE leo, actually. What's with the V? -So happy to see Chellsie back! Iffy illusion, but overall, a GREAT routine! -Kayla Williams... wow. Awesome floor. -Not a bad beam set for Ivana! -Not the best beam for Nastia, but it definitely could've been worse. -Sam's standing full to back pike = ROCK. Awesome routine!!! -NOOOO BRIDGET NOO. What a flukey fall! -Am I the only one who isn't crazy about Rebecca Bross? -How is Rebecca winning over Ivana?!?! -Good double layout on floor for Jana. Still, something about her looks... off to me. -I actually really like Sam's floor routine. Great tumbling! -You know why we're having all these lock-kneed landings? Because this new code is making the girls try to stick, and it is DANGEROUS. Stupid, stupid rule. -Surprisingly enough, not a bad score for Bridget after a not so great routine. 14.3. -Still not crazy about Rebecca. 100th Post, New Layout, and Nationals News! 100 Posts here at Gymchat! How excited am I that I've actually kept with this? But now, the BIG stuff. Nationals! Click Here for videos from Gymnastike from women's podium training and interviews with the guys after the night 1 competition! Click Here for pictures from senior women's podium training! Click Here for pictures from junior women's podium training! Inside Gymnastics has a complete section covering nationals, including notes from Nastia, pictures, daily takes, and articles. Senior competitions from women's day 1 and 2 and men's day 2 are being webcast via Universal Sports HERE. Jonathan Horton is leading the all-around, with David Sender and Tim McNeill rounding out the top 3. I would really like to see David win it this year, as he has announced that this meet will be his last hurrah. I talked with him for a bit at last year's Olympic Trials (just kinda ran into him in the stands), and he really does seem like a genuinely sweet, awesome guy. His vault (a yurchenko double pike) scored a whopping 17.050. Crazy. Women's day one is in store for today... bummer that the junior competition isn't being broadcast, but at least we have quick hits! First of all, let's clarify some people who will NOT be competing. -Shawn Johnson. She hasn't even gotten back into the gym, so NO. -Jordyn Wieber has pulled out of the competition. HUGE opportunity here for the rest of the juniors. Jordyn won last years junior title... and quite honestly, she (barring any major mistakes) probably would have won it again. -Alicia Sacramone, as she is retired (OR NOT! See below post). -Shayla Worley, as she has retired from elite gymnastics to focus on her upcoming NCAA career at Georgia. Kaitlyn hasn't made the national team yet. She was injured before the US Classic last year, and had to compete some watered down routines at nationals. She finished 16th. She did finish 3d AA at the Covergirl (US) Classic this year. We all know Mattie. She made a decent play at the Olympic team last year. Many believe she would have gotten one of three alternate positions if she hadn't injured herself at the training camp. She did pretty well during the European tour, but is injured once again. She probably won't be competing all-around, but rather focusing on bars and trying to make the worlds team (which I have doubts about, but who knows?). Much as I wish this girl would WAX HER EYEBROWS, FOR THE LOVE OF GOD, she is a pretty gymnast. Unfortunately, she's injured as well. Again, she'll focus on one or two events and try to make the worlds team as a specialist. The girl who went from a world silver medalist... to a nobody. Jeez! How does that happen? She choked at the Olympic selection camp competition... twice. But for some reason, she hasn't given up hope. She didn't do fantastically at the 2009 Us Classic, but she was sick. Hopefully we'll see a much healthier, cleaner Jana at nationals. This girl won the US (Covergirl) Classic this year! Granted, she WAS the only one to hit all four events, and that won't happen again at nationals. But still, she has a legit shot at placing top 5-7. Mackenzie only competed the first day of competition at Olympic Trials, and only competed bars at the US Classic this year. I'm not sure what the plan is for nationals, though I doubt she'll do all-around. If you ask me... this girl's got it. She's posted the highest AA out of any elite competitor in the world so far this year (59.6 at the American Cup), and she's consistent. I have a feeling she'll be making the world team as well. Does not have much of a shot... her score at the US Classic was a 52.7. To qualify to senior elite, you have to score 52.5. Talk about just squeaking by! Still... good for her! And who knows, she may surprise us! 2008 JO National Champion. She also won floor at the dual meet with Germany during the European tour. Floor looks like her best shot for a medal. Just qualified to senior elite earlier this year. Can't find much dirt on her. She was the 2007 US Challenge champion... but that's about all I can find. The next one from GAGE. Earned a bronze medal on bars and a 7th place finish on beam at the US Classic. She did not compete floor. She was 6th place at nationals last year as a junior. Cassie was the bronze medalist in the AA as a junior at last years nationals. She's been on the national team for 2 years. She trains at Cincinnati Gymnastics under Mary Lee Tracy. She won bars and was 4th AA at this years US Classic with a 54.7. She has a decent shot at placing top 10. Trains at the infamous Parkettes. 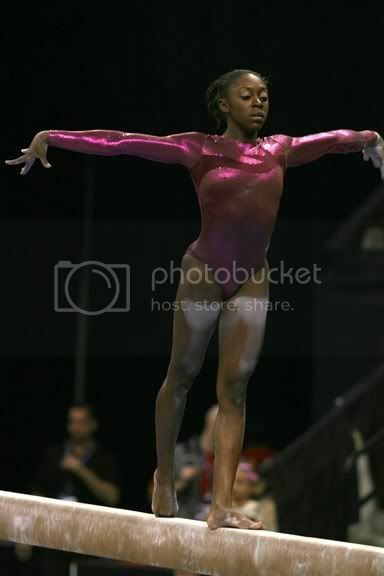 She was 10th AA at the 09 US Classic with a 52.5. Her best score was 14.15 on floor, which got her 4th place. Wouldn't expect her to place very high. Trains at WOGA... supposedly the next Nastia! Her bars are great! Unfortunately, the girl is plagued by injuries. She only competed bars at the US Classic this year, where she scored a 13.15 (with a fallen, watered down dismount). Not sure if her plan for nationals is AA or just certain events. If she does AA, she definitely has a legitimate shot at medaling. Ivana... what to say? She's now training with Papa Liukin at WOGA, after leaving GAGE (with quite the controversy!). She's a beautiful gymnast... she's just inconsistent! If she can pull together a good, consistent meet... she has a shot at being national champion. Unfortunately, that seems to be asking alot. I just really want to see her go 4 for 4! Finished 12th AA at the Olympic trials. Haven't seen much on her since then, so no word if she'll be doing AA. Well... it's Nastia! The Olympic champ! She WILL NOT be doing all around. Bars and beam she has confirmed, POSSIBLY floor, but not vault. She looked good on beam at the US Classic a week or so back... and from what we saw from the videos of training, she's pretty much back on bars as well! Very excited to see what she does. And I DEFINITELY want to see her new floor routine... aghhh! Finished 8th AA at the US Classic this year. She also was 7th on bars and 8th on beam. She was 19th at last years nationals. Talk about crashing onto the scene! Ever since she won JO Nationals earlier this year, she's been talked about like crazy! Lots of people are billing her as "the next Sacramone"... and many are talking worlds for her! Her vault and floor sets are amazing... she does a triple full AS A SIDE PASS. Ridiculous. :P She finished 5th AA at the US Classic this year and should be a force to be reckoned with, at least on vault and floor, at nationals. She is... crazy! Everytime you think she's down and out, she comes back! I don't know if she'll be doing all-around, but if she does, she DEFINITELY has a shot! She was 3'd at nationals AND Olympic Trials last year. She has yet to win a national title... could this FINALLY be her year?